I have the following items which are NOT for sale. I am just wondering what the value of these items is. I would also appreciate the age, origin or any other interesting facts you could tell me about these items. I hope to include pictures of these items to help aid in identification as soon as possible. Please E-Mail Me with any information you have. This is an old spinning reel of my fathers. Please tell me all you know about it. Great Britain, New Zealand, Switzerland, Australia, Canada, France, Sweden, U.S.A. 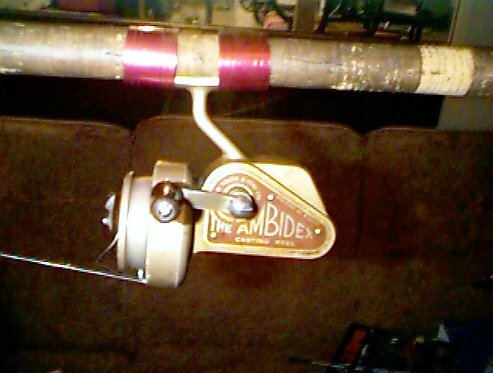 The reel appears to be brass, with a front drag. The above info. is printed on brass plates attached to each side. This old rod is also my fathers. Any info. would be appreciated. The Rod is a 7 foot, 2 piece spinning rod, with a cork handle. S70 Lures to 1/2 OZ. The rod appears to be woodgrain coloured fibreglass. This is an old lure of my fathers and it is in good condition, still in the original box. The box is not in too good of shape, but still original. I cannot read the #'s on the side of the box like so many of you have asked. Allcock, Laight & Westwood Co. The lure itself is in good condition with only a few scratch marks from the hooks. It has a metal lip, and is green & light brown, with red under the head. It has 3 treble hooks. Also in the box with the lure is a small metal rod about 2 inches long. The rod has little knobs on it, which are kind of hard to explain. Could anyone please tell me what this rod is for?